What are the different BioKube system sizes for different effluent standards? BioKube treats waste water using natural bacteria. This means that the more stringent the cleaning requirements are the more bacteria are needed. More bacteria means more filter area, more BioBlocks and consequently a bigger system. In other words, higher effluent standard requirement means a bigger and more expensive system. The water from a BioKube is cleaned to the standard degree required by the Environment Agency or SEPA. BioKube systems are modified as required so the effluent standard can always be met. All above systems can be equipped with Phosphorous reduction to the required level. All BioKube sewage treatment systems can also be equiped with UV light sterilisation equipment as relevant for reuse of the treated water for irrigation and flushing toilets. How many BioKube elements to achieve the required cleaning results? 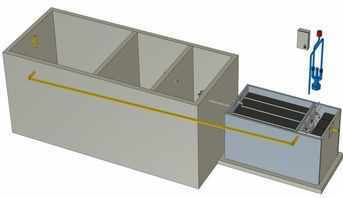 Below are 3D drawings below is a Jupiter 75 m3 / day system. The illustrations show the number of tanks used for different cleaning requirements. The drawings also show that in front of all BioKube systems is a pre cleaning unit to remove sludge in the incoming waste water. In small systems (up to 200 - 300 m3 / day) the pre-cleaning used will normally be a pre-settling tank to be emptied at specified intervals. In larger systems the pre-cleaning wil be a mechanical devise such as screens and / or belt filters as best in the specific system to keep the total cost as low as possible. The more stringent the cleaning requirements. In standard household sewage water with incoming BOD of 300 - 400 mg/l you can expect the following reduction of BOD from chamber to chamber. Reduction from pre-settling tank to chamber 1 in the BioKube. In a well designed pre-settling or septic tank you can expect about 25 % reduction of BOD meaning that the system can be designed for water entering the cleaning units to have BOD 300 mg/l. Reduction from chamber 1 to chamber 2. In chamber 1 you can expect a reduction of BOD from incoming 300 mg/l to 25 mg/l outgoing. This means that if the cleaning requirements are BOD below 25 mg/l the system only needs 1 chamber. In chamber 2 you can expect a reduction of BOD from incoming 25 mg/l to 10 mg/l outgoing. This means that if the cleaning requirements are BOD below 10 mg/l the system needs 2 chambers. Reduction from chamber 2 to chamber 3. In chamber 3 you will see nitrification (reduction of NH4). You can expect a reduction of to NH4 to below 5 mg/l. This means that if the cleaning requirements are BOD below 10 mg/l and there is requirement for NH4 reduction, then the system needs 3 chambers. As part of the basic BioKube technology, cleaned wastewater is recirculated back to the settling tank. This will in itself reduce N-Tot by 70%. The illustrations show the difference between the 4 typical effluent standards that BioKube achieves. In all 4 systems you see the 3 chamber pre-settlment tank in front of the Jupiter unit to retain sludge. Also illustrated is the sludge return from the cleaning units to the pre-settlement tank. This returns baceteriological sludge to the pre-settlement chamber and thereby keeps the system free from sludge. BioKube Jupiter 2 step system. Will clean to BOD < 10 mg/l. One air blower and one control box for both Jupiter systems. BioKube Jupiter 3 step system. Will clean to BOD < 10 mg/l and NH4 < 5 mg/l. One air blower and one control box for all three Jupiter systems. BioKube Jupiter 3 step system with ad on for N-Total reduction. Treated wastewater irs recirculated several times to an extra chamber in the Pre-setteling tank. One airblower and one control box for the whole system.